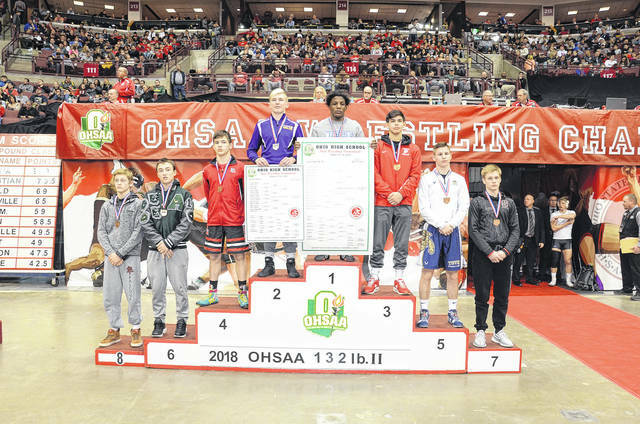 Eaton’s Wade Monebrake (fourth from left) became only the seventh wrestler in program history to wrestle for a state championship when he battled Jordan Decatur of Cuyahoga Falls Cuyahoga Valley Christian Academy on Saturday, March 10. 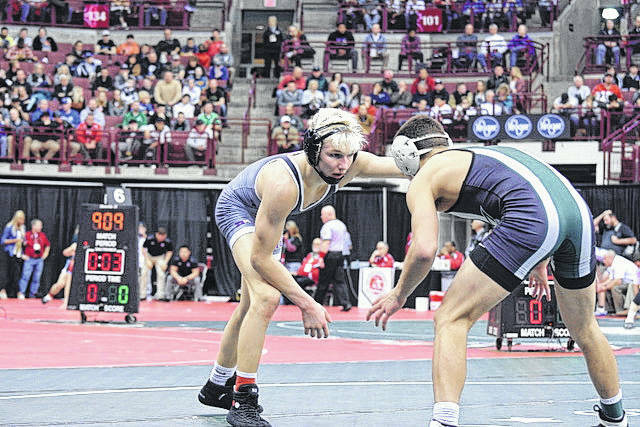 Monebrake’s season ended with a 14-4 setback and as the state runner-up at 132-pounds in Division II. 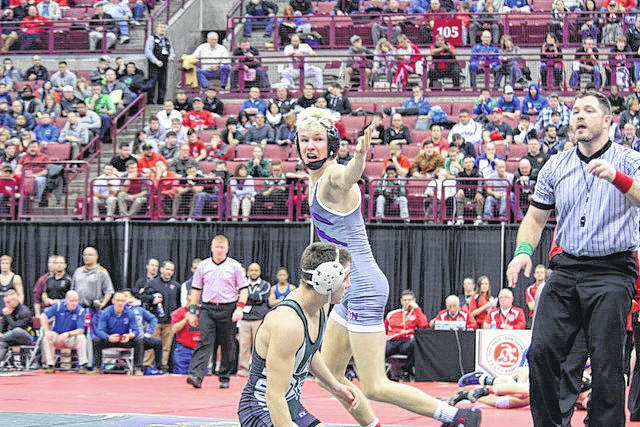 Eaton’s Wade Monebrake celebrates his 8-4 semifinal win over Jack Gorman of Aurora during the 81st Annual Ohio High School Athletic Association State Wrestling Tournament on Friday, March 9. 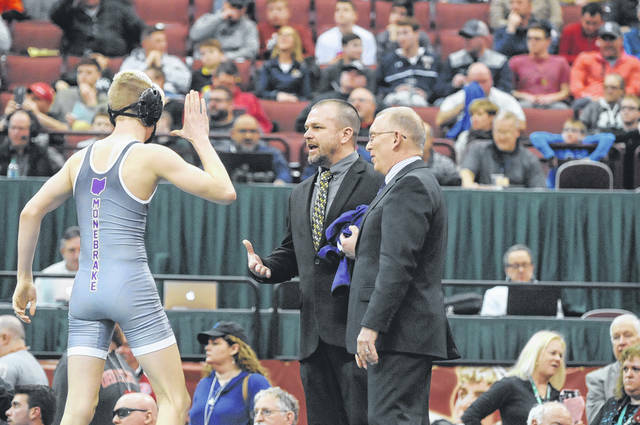 COLUMBUS — Wade Monebrake joined an exclusive group when he wrestled for the Division II 132-pound state championship Saturday, March 10. 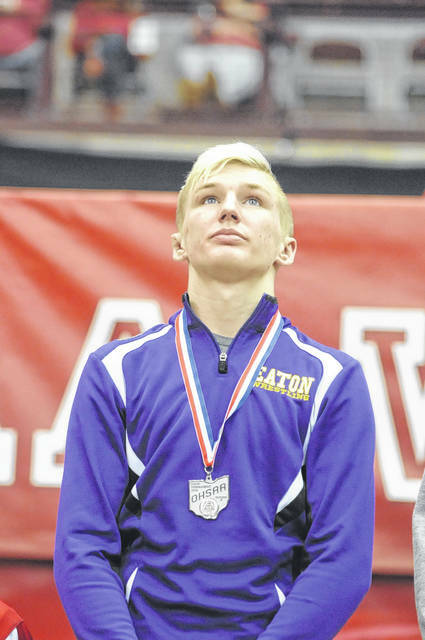 The Eaton High School junior became only the seventh wrestler in program history to compete in a state title match and first since Jacob Welch did so in 2000. 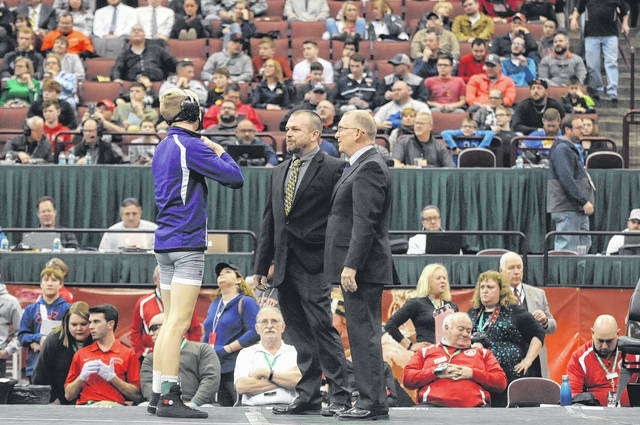 Monebrake came up short in his quest to become just the fourth state champion in school history when he lost to nationally ranked Jordan Decatur of Cuyahoga Falls Cuyahoga Valley Christian Academy, 14-4, during the 81st Annual Ohio High School Athletic Association State Wrestling Tournament at the Jerome Schottenstein Center. Eaton coach Mark Silvers agreed with Monebrake. Despite falling behind 6-2 after the first period, Monebrake kept attacking, but Decatur had an answer for every move as he expanded the lead to 10-3 after two periods. 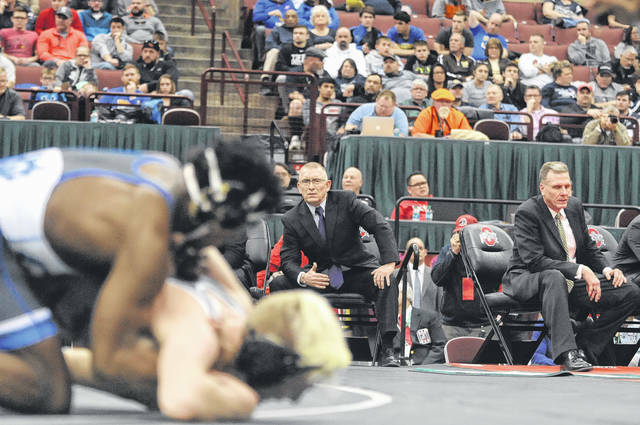 Monebrake, who qualified for state as a freshman, used last season’s experience of attending the state tournament as a spectator as motivation. He finished fifth at the district and was an alternate at the state tournament. 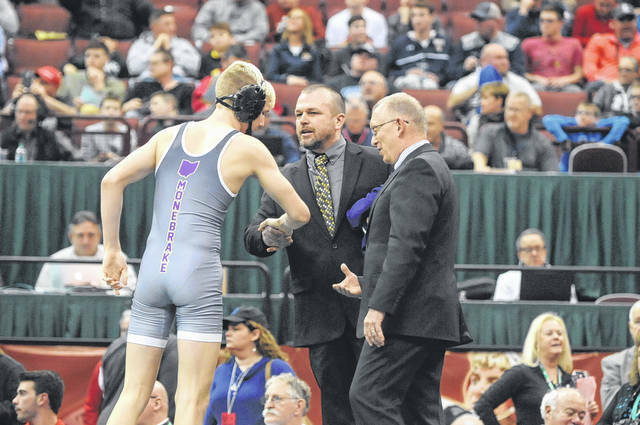 Eaton coach Mark Silvers credited Monebrake’s support system and work ethic for his successful season. Silvers said Monebrake, who finished the season with a 48-3 record, had an outstanding season and has set the bar high — not just for himself next season but for the entire team. “Awesome season. He just had a great year. To rebound from last year’s disappointment with the attitude and everything, the work ethic he’s shown, he’s not here by accident. 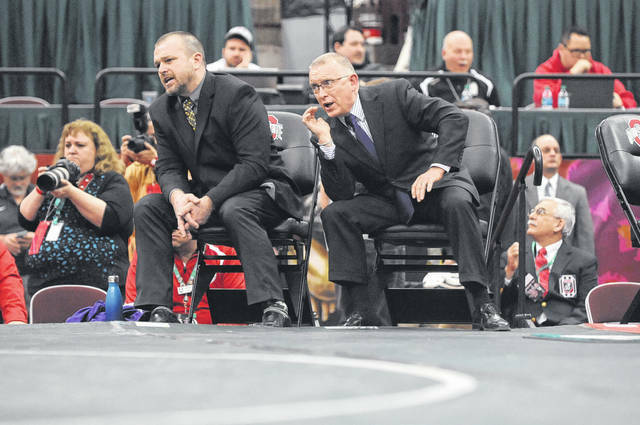 He’s here because he outworked everybody else to make that happen,” said Silvers, who was coaching his first Eaton wrestler in the state finals. 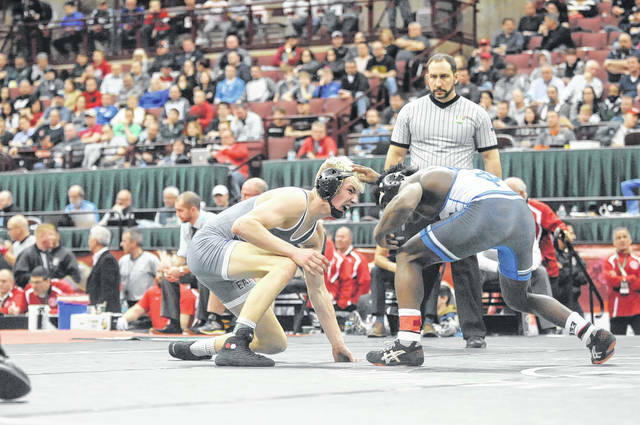 To reach the championship bout, Monebrake defeated Emileo Calderon of Sandusky Perkins, 6-3, in the first round, Edward Suber of Akron St. Vincent St. Mary, 3-1, in the quarterfinal and Jack Gorman of Aurora, 8-4, in the semifinals. Monebrake joins Terry Gallimore (1975), Matt Lindley (1986) and Aaron Buzbee (1990) as state runner-ups. 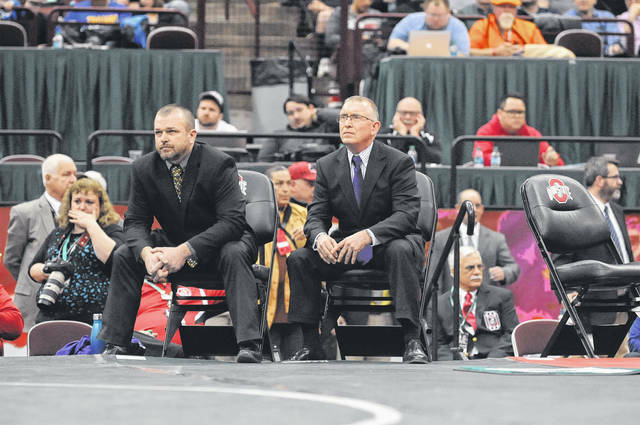 Josh Cruze (1990), Butch Hildebrand (1995), and Welch (2000) all won state titles.